Every maker has a story. Be a part of Designs By Tonino's story by placing an order, leaving a review, and seeing your review appear here. 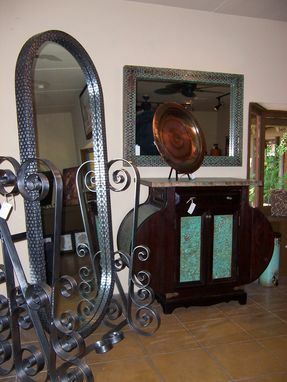 Beautiful Traditional Cheval Style Mirror. Oval hand weaved mirror sitting on a a heavy metal scroll base. The mirror can detach from the base.